Flat plate solar collectors - Stroj-energijska tehnika d.o.o. Up to 35% more energy than with the SEC absorbing tube design or the SEC evacuated tubes. These are the results of two years of research and practical comparative testing. The operation of various solar collectors and comparative tests can be viewed in our showroom, at the headquarters of the company. The central component of the solar heating system is a solar energy collector (SEC). STROJ SEC is a solar energy receiver, adjusted for operation in the most demanding climatic conditions. Maximum efficiency is achieved by installing SEC into STROJ heating system, where the possibility of a direct heat transfer is exploited. High performance of SEC is the result of 40 years of development in the company Stroj - energijska tehnika d.o.o. Both SEC and the entire heating system operate without the need for antifreeze application. The patent-protected solar heating system STROJ is very powerful, reliable, and greatly increases the year-round utilisation of the heating system. Most of the incident solar radiation is absorbed by the flat plate absorber, while a minimal part of the radiation energy is deflected into surrounding area. 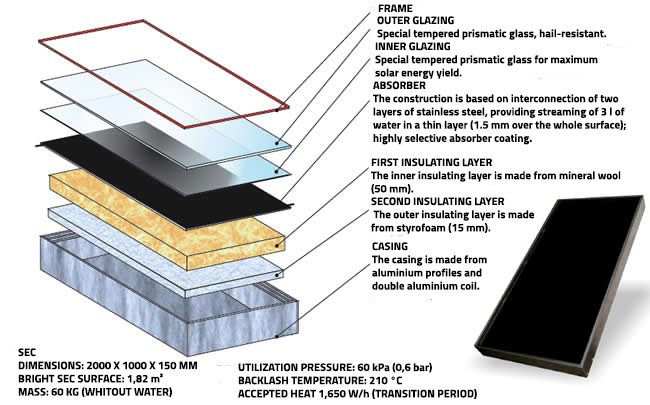 STROJ SEC has a double glazed layer, which greatly reduces the radiation loss in less favourable operating conditions. The absorber is of a compact design, and consists of stainless steel, coated with a special selective coating. The absorbed energy entering through the double prismatic glass is converted into heat, and transferred to the heat transfer fluid (water). The medium transfers the heat from SEC into the buffer tank or into the combination boiler.